Move your cursor to the edge indicated by the 2 red arrows and you should be able to drag to the right. Windows / Re: What search plugin do I need to install for v4.1.5? Well this forum is absolute rubbish! Hundreds of views and no replies. Pfft. Maybe you'd have preferred hundreds of "I don't know" replies?! So in answer to your question... I don't know. I just opened qBittorrent on Windows XP. I don't think the "arrow" can be removed. 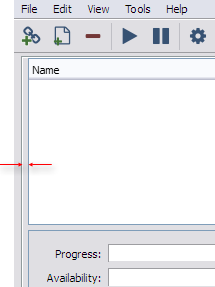 It will always show on one of the column headers. As for the blue highlight on that selected column header, it must be something that shows on operating systems other than XP (at least). Therefore, I don't see it - phew! Windows / Re: qBittorrent trying to access Google? I've just installed qBittorrent, but it tries to access Google? ... Why does qBittorrent needs such request? Maybe Google is the search engine that's used if looking for torrents to download...? Windows / Re: qBittorrent 32-bit vs 64-bit - Witch one to use? Don't be - arso96 is the confused one. The 64-Bit is fine. Windows / Re: How To Stop Torrent Files Coming Up? Are you on the correct forum? Windows / Re: Why show an ETA when there's no chance of completion? How many Seeds & Peers? - Even if availability is 100%, maybe some connected to you are seeding at a very low kb/s rate. How is the ETA calculated? Selected file size x download data rate = ETA. How do I exclude certain files when I select a folder, when I create a torrent? I don't see any option to do this. I have tried selecting a file instead, but selecting a second file merely replaces the original rather than adding to it. Interesting. I can't figure out how to do that either. A workaround would be temporarily moving the unwanted files out of the folder first. Then add folder to create the torrent. Once done, put the moved files back in. Windows / Re: qBittorrent sound volume is too low. I'm not sure what you're smoking but if I were you I'd stop. Why there are no button "get lost, i don't wanna any updates". And it was really hard to find such button in options. I have qBittorrent installed, but I use another client 99% of the time. Tools>Options>Advanced>Check for software updates (uncheck box). I've read that this domain is related to malware. And you're wondering why Avast blocked it?? ?